Hot Chilli Oil is not for the faint hearted. Nor is it as hard to make as one might expect. My aunt Fopin, who is an amazing cook, taught me how to make homemade chilli oil from fresh red chillis, garlic, vegetable oil, and a dash of salt’n sugar. I was enroute to her house in Wimbledon for the weekend once and she asked me if I could pick up a bag of fresh red chillis, not an impossible request. She proceeded to make her own sauce by first blending the chills in a food processor and frying the mixture in vegetable oil. I had bought a very hot bag of chillis, so hot that chilli fumes from the wok were causing my uncle Mike to start coughing in the kitchen—it’s almost impossible to know how hot the chills are, one might be really hot, the other more on the mild side. 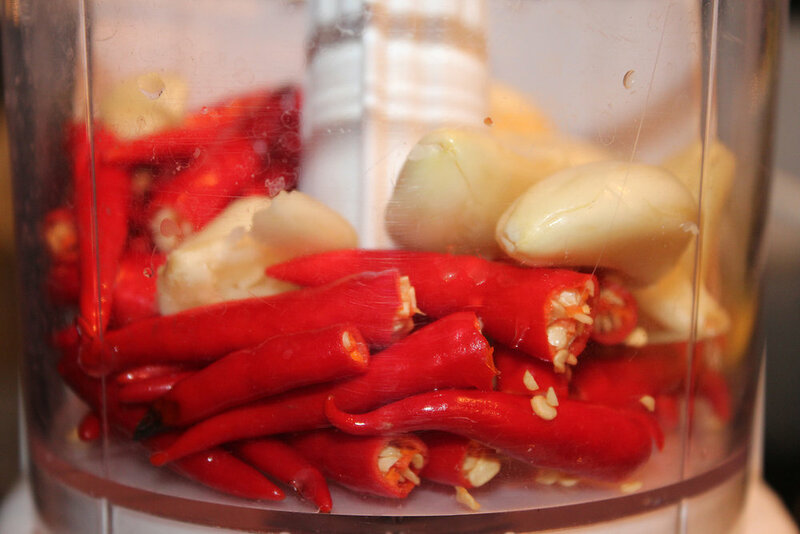 She also makes a great chilli paste type of sauce, but this recipe is more oil based. Many Chinese recipes, in particular Sichuan and Hunan, call for chilli oil and you can get away with using the over-the-counter variety purchased at your local East Asian markets or even the major western supermarkets like tesco. But we all know homemade is the way to go and I don’t need to explain more on that. Wash the chills and cut off the stems. Discard the stems. Combine with the garlic in a food processor and blend the hell out of it. Heat the oil in a wok and fry the chills for 3 minutes stirring constantly. At times tilt the pan to the side to allow for the oiled mixture to swish down and around. Add the salt and sugar towards the end. Store in a jar in the refrigerator. This will last a long, long time. I'm talking months here. I mainly use this oil for seasoning when cooking or combine when I'm making a dumpling dipping sauce. You don't drink this mixture out of a cup. As the oil supply runs down, you can add more oil and mix. 1. Wash the chills and cut off the stems. Combine with the garlic in a food processor and blend the hell out of it. 2. Heat the oil in a wok and fry the chills for 3 minutes. Add the salt and sugar towards the end. 3. Pour into a bowl to cool. 4. Store in a jar.